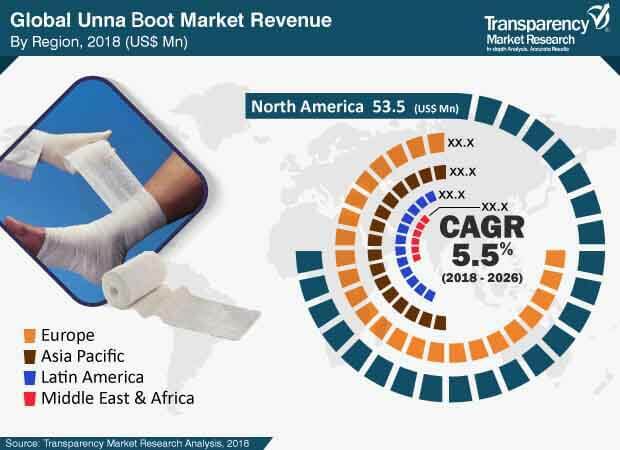 The global Unna boot market was valued at over US$ 9 Mn in 2017 and is projected to reach US$ 144 Mn in 2026, expanding at a CAGR of around 5% from 2018 to 2026. Rise in prevalence of venous leg ulcers and increase in incidence rate of injuries related to accidents, sports, and adventures are driving the global Unna boot market. Venous leg ulcer is highly common among people over 65 years of age. Surge in aging population across the globe and better wound healing and efficacy at competitive prices offered by Unna boot are the major factors propelling the growth of the global Unna boot market. However, unfavorable reimbursement policies and highly fragmented nature of the market affecting revenue generation are the key concern areas associated with the global Unna boot market. In terms of raw material, the global Unna boot market can be segmented into zinc oxide and zinc and calamine. The zinc oxide segment held a major share of global Unna boot market in 2017. Increase in demand for multilayer compression bandages and rise in prevalence of leg ulcers and associated conditions are the major drivers of the segment. The zinc and calamine segment is expected to expand at a significant CAGR during the forecast period, as these materials help in reducing the tendency of itching, and thereby, being preferred by growing number of patients. Based on application, the global Unna boot market can be divided into venous leg ulcers, lymphedema, eczema, and others. The venous leg ulcers segment was dominant among all in 2017, and is expected to maintain its position during the forecast period. Factors such as high prevalence of leg ulcers, severity of the condition, and its long-term management are boosting the growth of the segment. The others segment, consisting of burns and leg injuries, is expected to grow rapidly in the next few years due to rise in demand for traditional therapies and lower irritation rate and higher level of patient comfort provided by these therapies. In terms of region, the global Unna boot market can be segmented into North America, Europe, Asia Pacific, Latin America, and Middle East & Africa. North America was the dominant market for Unna boot in 2017 and is expected to maintain its position during the forecast period. Factors, such as, high prevalence of venous leg ulcers, lymphedema, and eczema and rise in awareness among patients and caregivers are contributing to the growth of Unna boot market in the region. The Unna boot market in Asia Pacific region is expected grow at a significant CAGR during the forecast period owing to growth in geriatric population, large patient pool, and rise in health care expenditures in the emerging countries in the region, such as China and India. Prominent players operating in the global Unna boot market include Medline Industries, Inc., American Medicals, Cardinal Health, BSN Medical, ConvaTec, Inc., Andover Health, Inc., GF HEALTHCARE PRODUCTS, Inc., and DERMA SCIENCES. Medline Industries, Inc. and ConvaTec, Inc. are the major global market players in Unna boot. Medline Industries, Inc. has strong presence in all the regions, through partnership with subsidiaries and distributors. Leading market position, robust operational network, and high-quality products provide the company an edge over its competitors. This report analyzes the current and future scenario of the global Unna boot market. Unna boot is a special traditional gauze bandage, used for the treatment for venous insufficiencies of legs and hands. Prevalence of diseases such as venous ulcer is increasing globally. Rise in the rate of accidents and injuries related to sports and adventures is also posing serious concern to general health. Unna boot is useful in such cases, as it has a special dressing of inelastic gauze, impregnated with zinc, glycerin, or calamine. Unna boot is useful in healing wounds and generating new tissues. The market for Unna boot is growing significantly due to rise in cases of venous leg ulcers and injuries caused due to accidents, sports, and adventures. The venous leg ulcers segment of the Unna boot market is anticipated to grow rapidly during the forecast period due to fast healing and lower frequency of dressing change offered by Unna boot in the treatment of venous leg ulcers. Global aging population and better efficacy and wound healing at competitive prices offered by Unna boot are the other key factors driving the global market. This report on the global Unna boot market comprises an elaborate executive summary, including a market snapshot that provides information about various segments of the market. The report also provides information and data analysis of the global market with respect to its segments based on raw materials, applications, and region. A detailed qualitative analysis of drivers, restraints, and opportunities of the market has been provided in the overview section. Additionally, the market outlook section offers key insights of the global market such as disease epidemiology by application and major mergers and applications. The competition landscape section comprises competitive matrix and company profiles with business overview to project the competitive landscape of the market. It also provides market attractiveness analysis, in terms of region and key strategies adopted by players, thereby presenting a thorough analysis of the overall competitive scenario prevailing in the global Unna boot market. Based on raw material, the global Unna boot market has been segmented into zinc oxide and zinc and calamine. In terms of application, the global Unna boot market has been divided into venous leg ulcers, lymphedema, eczema, and others. Each of the segments has been analyzed in detail in terms of market trends, recent developments, drivers, restraints, opportunities, and useful insights. The report gives current and future market size for each segment and sub-segment of the market for the period of 2018 to 2026, in terms of revenue depicted in US$ Mn, considering 2016 and 2017 as the base years. The compound annual growth rate (CAGR) has been provided for each segment and the overall market for the period of 2018 to 2026, along with market size estimations. In terms of region, the global Unna boot market is divided into North America, Europe, Asia Pacific, Latin America, and Middle East & Africa. The regions have been further sub-segmented into major countries and sub-regions. The current and future market size, in terms of revenue, of the Unna boot market at the regional and country level has been provided in the report for the period of 2016 to 2026, along with their growth rate in percentage for the period of 2018 to 2026. The study also provides useful insights of the market, expected to help new companies willing to enter the market and existing companies seeking to increase their market share. The report profiles major companies operating in the global Unna boot market in terms of attributes, such as, company overview, financial overview, product portfolio, business strategies, recent developments, and SWOT (strength, weakness, opportunity, and threat) analysis. Major companies mentioned are Medline Industries, Inc., American Medicals, Cardinal Health, BSN Medical, ConvaTec, Inc., Andover Health, Inc., GF HEALTHCARE PRODUCTS, Inc., and DERMA SCIENCES.